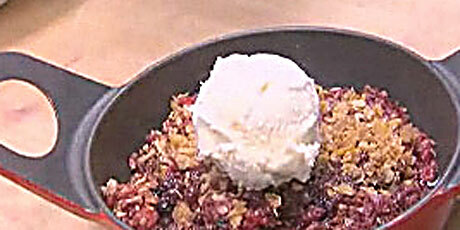 Whip up this dessert for a warm fruity treat. 2. In a large mixing bowl, toss your berries together. Add your white flour, and white sugar – give it a good toss. Transfer the berries into your baking dish. 3. Crush the dried oats, granola and Corn Flakes into the mixing bowl. 4. Add a ½ cup of brown sugar, and your melted butter. 5. Toss well, so that all the dried ingredients get nice and buttery. 6. Cover your berries with buttery crumble. 7. Bake for approximately 40 minutes until the crumble is golden brown and the fruit starts to bubble on the sides. 8. Serve with a ball of vanilla ice cream.